Readers often assume that each worthwhile story or poem is separate and unique, something that either emerges exclusively from one person’s individual creativity or has been inspired by forces beyond mere human knowledge–a “muse”, perhaps. And certainly, every interesting literary text does express the unique combination of cultural and other forces that make up the imagination of its writer. But writers have repertoires and work from their knowledge of previous texts just as much as readers do. The idea of a story about a detective figuring out which suspect committed a crime doesn’t occur independently to each person who writes a mystery novel. Most mystery writers have read many such texts before deciding to create their own. It’s no secret that the success of Harry Potter is a big secret. In other words, no one really knows why it became so popular. HP Fans will of course say that it’s because the books are so good, but widely-read specialists of children’s literature don’t fully accept this reason, because Harry Potter contains nothing that was really new or ground-breaking. The Harry Potter stories are good, solid stories (an ‘enjoyable romp’ according to Kirkus), and no better or worse than many similar tales that came before (and after) it. Indeed, the stories share qualities with much other children’s fiction. Harry Potter himself is an orphan who, to begin with, lives with rigidly conventional people who are nasty to him–just as child heroes of children’s fiction have been orphaned and misunderstood throughout the history of children’s literature. The tone of the Potter books, a blend of comedy and melodrama, share’s much with Dahl’s writing in Matilda and in books such as James and the Giant Peach and Charlie and the Chocolate Factory. As stories set in a school, meanwhile, the Potter books reproduce the typical conventions of boarding school stories, particularly as represented in British boarding school stories from Thomas Hughes’s Tom Brown’s Schooldays to Frank Richards’s Billy Bunter series: characters of fairly stereotypical types and backgrounds indulging in hijinks, practical jokes, and sporting competitions. In this case, the novels are fantasies rather than realistic fiction, and the school trains witches and wizards. But that also happens in Ursula Le Guin’s Wizard of Earthsea and Diana Wynne Jones’s Chrestomanci books. [I would add Jill Murphy’s Worst Witch stories.] 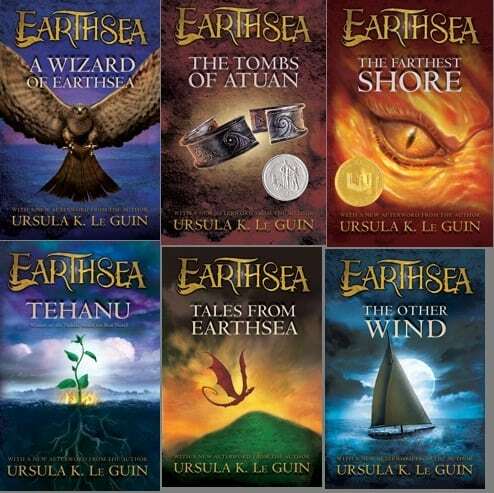 Furthermore, many other fantasy series share the Potter books’ emphasis on characters maturing into a growing understanding of of their own powers and of the nature of good and evil through contact with unusual beings, not all of them human: not only Le Guin’s Earthsea books but also C.S. Lewis’s Narnia series, Susan Cooper’s Dark Is Rising series, Monica Hughes’s Isis series, and Lloyd Alexander’s Prydain series (which also shares some of the Potter books’ breezy comedy). Like these series, also, the Potter books seem to be heading toward a climactic confrontation between a young protagonist and someone or something powerful, adult, and intensely evil. [Nodelman and Reimer wrote this in the early 2000s — they were right!] Different versions of this plot operate in recent critical successes within the filed of children’s literature such as Philip Pullman’s Golden Compass and Lowry’s The Giver and Gathering Blue, and also in Kristina Applegate’s popular Animorphs series. Nodelman and Reimer dismiss also the possibility that the Harry Potter books were expertly marketed, because in fact they were marketed no differently from any other book from the same publisher. They posit that the HP books are so successful precisely because they are a perfect blend of what has come before. As John Truby says of screenwriting, blending genres is the hardest thing to do. Perhaps what Rowling did was the kidlit equivalent of this. William Mayne – an English writer for children who is nonetheless notoriously under-read by children but read by adults. He published books between 1953 and 2009, but you may not have heard of any of them. You can still get your hands on A Swarm In May and a few others. Some of these authors you have probably heard of — others may be new. In any case, if you know of a reader suffering from Harry Potter withdrawal after reading the final volume, point them in the direction of his formidable ancestors. Next PostNext What are the kids reading? Two sides of the kidlit fence.